Hello blogosphere! Happy 2016!! We survived winter and the geology field season is ramping back up in the northern hemisphere. To kick off the 2016 fieldwork campaign I went with Brown University’s Limnology class, taught by Jim Russell, on a field trip to New Hampshire. The goal of the class is for students to become familiar with and proficient in all things related to lakes, and this includes field sampling. Six students, Jim, and I went to Pout Pond, near the town of Belmont, NH to take water measurements and samples. Students measured lake temperature, pH, dissolved oxygen, conductivity, alkalinity, and secchi depth, and took water samples to measure salts and nutrients. Here are some pictures from the beautiful day. Brown University Limnology class, 2016 (Well, half the class anyway. The other half of the class will sample Pout Pond from a boat later this semester). 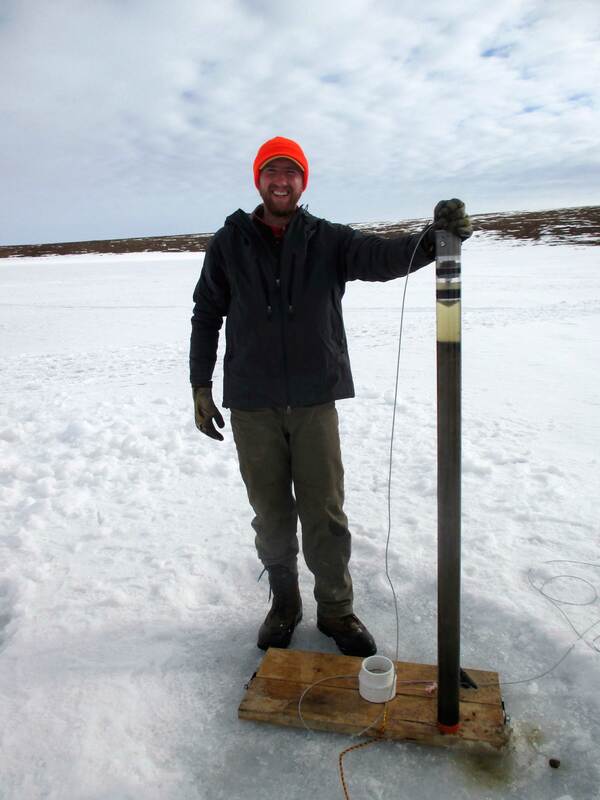 Yinsui uses a kemmerer water sampler to collect water from 1 m depth increments. The vertical profiles of water chemistry, temperature, etc. can tell a lot about the state of a lake. For example, in 10 years limnology field trips, Pout Pond has remained permanently stratified, with a salty, dense layer of water at the bottom. Lakes with permanent stratification are called meromictic. Patrick measuring alkalinity using a colorometric test kit. Patrick, Nick, and Rebecca collecting water samples. The class samples Pout Pond in Belmont, NH on a beautiful winter day. Yinsui and Sydney filtering water for anion, cation, and nutrient analyses. What’s the secchi depth, Jim? This entry was posted in Uncategorized on April 1, 2016 by williamcdaniels.